Cross your eyes and break out the 3D glasses! 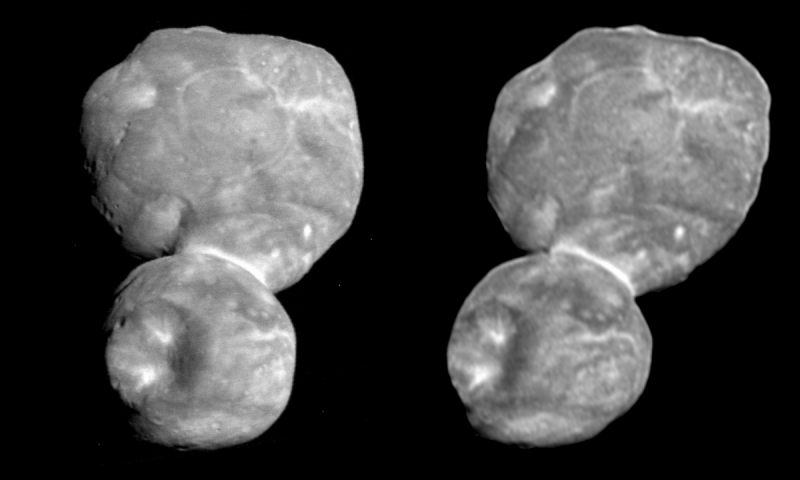 NASA's New Horizons team has created new stereo views of the Kuiper Belt object nicknamed Ultima Thule – the target of the New Horizons spacecraft's historic New Year's 2019 flyby, four billion miles from Earth – and the images are as cool and captivating as they are scientifically valuable. 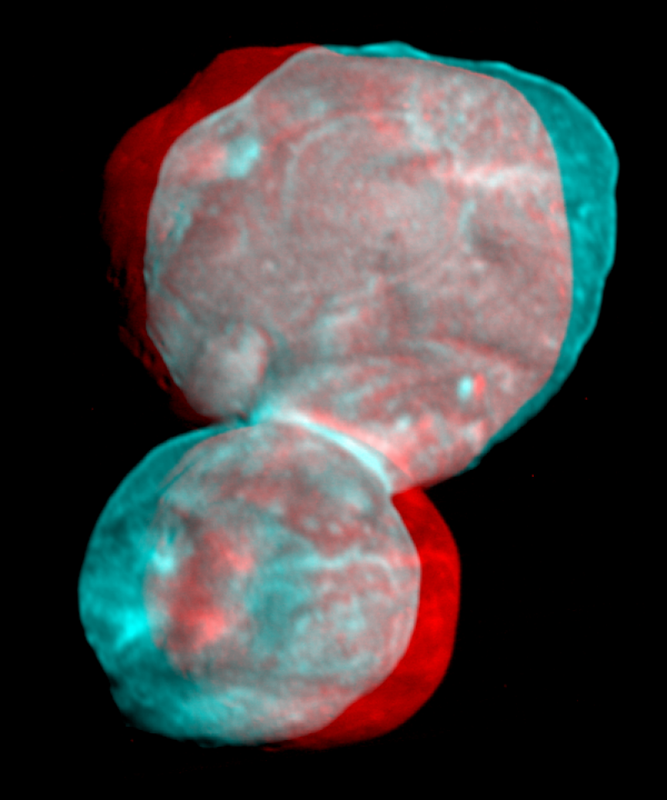 This image of Ultima Thule can be viewed with red-blue stereo glasses to reveal the Kuiper Belt object's three-dimensional shape. The 3D effects come from pairing or combining images taken at slightly different viewing angles, creating a "binocular" effect, just as the slight separation of our eyes allows us to see three-dimensionally. For the images on this page, the New Horizons team paired sets of processed images taken by the spacecraft's Long-Range Reconnaissance Imager (LORRI) at 5:01 and 5:26 Universal Time on Jan. 1, from respective distances of 17,400 miles (28,000 kilometers) and 4,100 miles (6,600 kilometers), offering respective original scales of about 430 feet (130 meters) and 110 feet (33 meters) per pixel. "These views provide a clearer picture of Ultima Thule's overall shape," said mission Principal Investigator Alan Stern, from Southwest Research Institute (SwRI) in Boulder, Colorado, "including the flattened shape of the large lobe, as well as the shape of individual topographic features such as the "neck" connecting the two lobes, the large depression on the smaller lobe, and hills and valleys on the larger lobe." 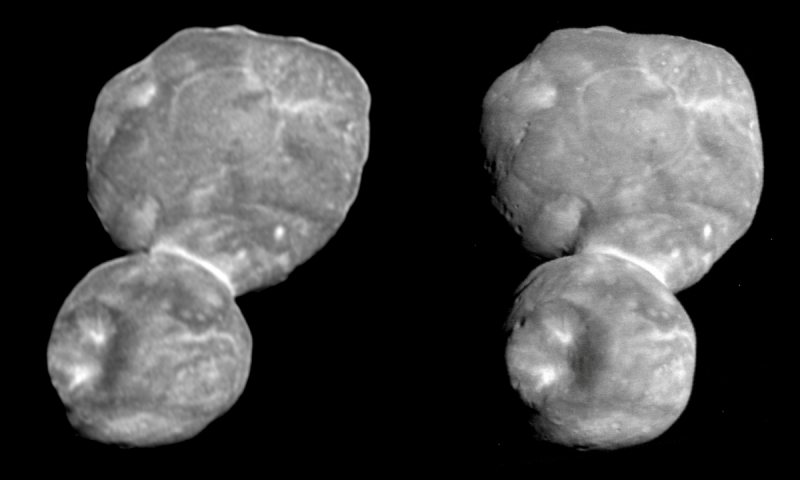 "We have been looking forward to this high-quality stereo view since long before the flyby," added John Spencer, New Horizons deputy project scientist from SwRI. "Now we can use this rich, three-dimensional view to help us understand how Ultima Thule came to have its extraordinary shape." The Johns Hopkins University Applied Physics Laboratory in Laurel, Maryland, designed, built and operates the New Horizons spacecraft, and manages the mission for NASA's Science Mission Directorate. The MSFC Planetary Management Office provides the NASA oversight for the New Horizons. Southwest Research Institute, based in San Antonio, directs the mission via Principal Investigator Stern, and leads the science team, payload operations and encounter science planning. New Horizons is part of the New Frontiers Program managed by NASA's Marshall Space Flight Center in Huntsville, Alabama. For this view, change your focus from the image by looking "through" it (and the screen) and into the distance. This will create the effect of a third image in the middle; try setting your focus on that third image. For this view, cross your eyes until the pair of images merges into one. It might help to place your finger or a pen just a couple of inches from your eyes, and focus on it. When the background image comes into focus, remove the closer object and concentrate on the image. This brief animation "flickers" between New Horizons spacecraft views of Ultima Thule, the spacecraft's New Year's 2019 flyby target in the Kuiper Belt.